Recently, I’ve been reading through the collected works of french comic artist Jean “Moebius” Giraud. Moebius’s works are sci-fi/fantasy epics that are fast paced, with the story holding a consistent but somewhat disjointed thread throughout the piece. I’m on page 127 of the 300 some page work L’Incal, and new things are constantly happening and resolving without much exposition or leadup. New characters are being introduced with little backstory or apology to the reader, but as the story continues along it all merges together to make a cohesive whole. Comics by Moebius are often action packed epics that range throughout vast lands or across worlds and keep the action and story moving along, even if it doesn’t make complete sense or seems a little Deus Ex Machina at times. Sound to you like a typical roleplaying game? There is a lot that can be learned from Jean Giraud’s story pacing styles, especially as people have less and less time for gaming in their lives. 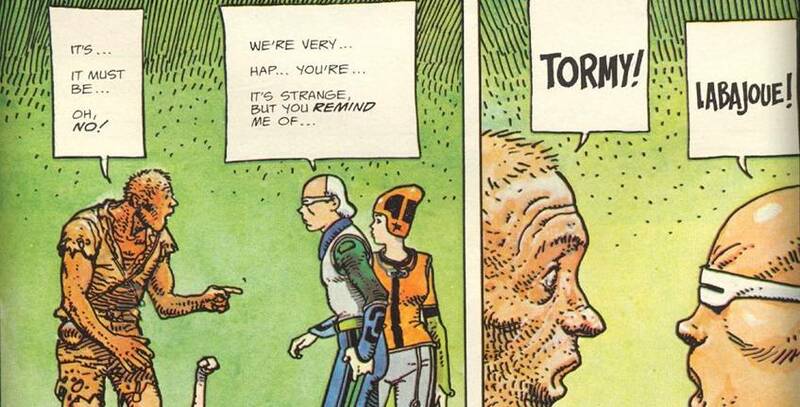 There are a few key areas that make Moebius stories work. There are often analogues to structures we use in tabletop roleplaying. Often they are about a disparate group of people that come together to face down a threat. The heroes and heroines of the stories are often introduced with little backstory and are plopped before the reader with only a scant explanation of who they are. Some power or ability will be used once and without much explanation or leadup, but only because it is appropriate to that situation. Character development and narrative will usually happen mid-way through the story. The main BBEG is often introduced in only brief snippets and their actions occur “off screen” for the heroes but still affect them. When very little is happening or there is no logical next step, something often attacks and moves the story along. When things seem stalled or there is little chance of moving forward, a deus ex machina pushes things along. Moebius’s stories often start with a seed of an idea and develop more as they go along. Sometimes they are heavy handed and lack a subtlety seen in other works, but they are always interesting, unique, and keep me glued to the page to see what happens next – despite their flaws as a coherent well thought out plot. Roleplaying games are like this. We can’t control what happens and a good gaming experience wouldn’t necessarily make a good novel or movie. The importance and fun of the experience is in something else, something only loosely held together by the story. [pullquoteleft] From a player’s perspective, it means more time spent doing and less time spent siting around waiting to do. [social_warfare] [/pullquoteleft]The story bends to the demands of that other experience. In the case of many of Moebius’s works, it is because the art is fantastic and the action keeps coming. What starts as a ride through a forest on a strange mount by a hero flips to a few micro-sized people piloting a giant humanoid robot through a ruin trying to fit into an alien society and ends with a bi-plane bombing a town. It doesn’t all fit together except by very loose threads, but you want to know what happens next. In the case of roleplaying games, the story bends to the demands of the game and the players. If Joe’s character isn’t getting enough spotlight and you sense yourself losing his investment, you switch the story to him even if it would make more sense to keep the current thread with Jeanie and Rick going. If you’ve got a player with an incredible power to grow large in your game, you find a reason for him to battle against other giant sized opponents, even if they wouldn’t fit the logic of the world in any more than passing fashion. The story gets validated in the player’s minds because they get to be a part of it and it is a fun experience. Roleplaying games and Moebius’s stories already have many common elements, but there are a few ways we can take the story pacing set up by Moebius and apply them to our games to advantageous effect. 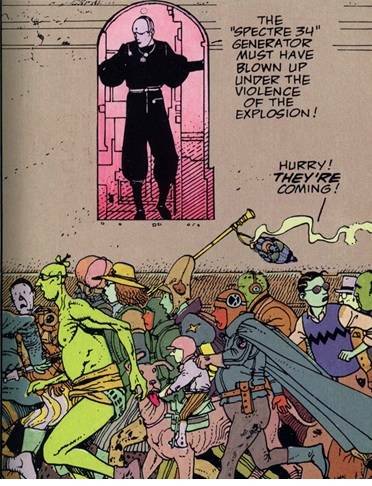 Often Moebius uses the narrator’s voice to quickly move into the action without having to do a lot of setup. You can emulate this by asking your players “What next?”, getting their actions, and then narrating them to the next important roll they will make. The action still occurs, but instead of spending a lot of time on each player’s rolls and failures, you emphasize the ones that move the action forward, emphasizing the narrator voice as you outline the action and move to the next important bit. From a narrative aspect, much of the action in a comic book is the result of a success or a failure and not the attempt at it. 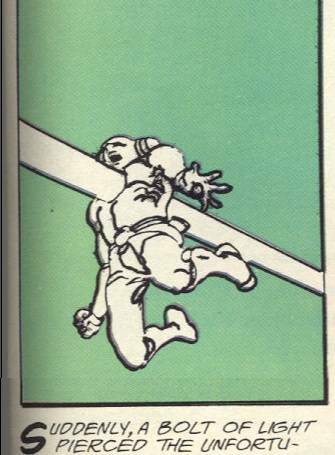 Rarely is the hero winding up to take a punch and then swinging, but instead you see just the connect and the damage. Misses aren’t even shown unless they have narrative impact. We can simulate this by doubling up on rolls wherever possible. For things like attack rolls, roll damage at the same time so that you can quickly move from success to damage and let the player narrate the attack in one fell swoop of action. For rolls like searching for a secret door, have the player roll to pick the lock (or other appropriate action) at the same time. If they find a door, you can have them open it as they find it. If they don’t find the door or it was never there, then you move on with the addon roll just being another die on the table. The key to this technique is to have multiple actions combined (when it makes sense) as often as possible. It keeps the narrative flow a single straight line without small pauses so the player can say what they were going to do if they succeeded. Added bonus, it means time in the spotlight is emphasized as players will feel the focus more keenly even if the actual time isn’t extended. The strange blue man you meet isn’t described, brought up, or focused on until he is important. When he is important, players have whatever knowledge they need to move the situation along. If the PCs are searching for a fence who might have heard about a recent robbery and the person trying to acquire the stolen item, the players are likely to make rolls to get that information. (Dragging in #2, Combine rolls, ask them to make their intimidate or diplomacy roll at the same time as their roll to find the fence.) That’s the moment that the NPC with the information pops into existence. You can let the PC who used their knowledge of the criminal syndicate know who the fence is and what he is susceptible to, justifying their roll to intimidate or coerce. Once that NPC is involved, they’ve got the spark and are suddenly someone in the story, not just a background element. Before the PC made the roll, nothing mattered about the strange blue man in the background. Now, however, the PC knew all about him and was probably searching him out, and he probably has the knowledge that is actually needed. As you move along, he becomes important and gets a name – Carnelian. He becomes a piece of the story and is probably the go to person for information about the underworld. As I mentioned, Moebius’s style of storytelling has some flaws from a narrative perspective and it isn’t for everyone. For a quick paced and action oriented game, it moves things along and keeps the focus on what is important to that game. From a player’s perspective, it means more time spent doing and less time spent siting around waiting to do. Interestingly enough, it also strikes a parallel with older style games. That might lead one to think it emphasizes railroading, but if you are careful about considering the pacing and action and ensuring player options, focusing on the bits of your game that move the narrative forward will really keep the excitement high. It might require a bit more suspension of disbelief, but it will garner more player engagement. That makes this style of pacing perfect for a convention game or a game where you know you have limited time. What do you think of this frenetic style of pacing? Are you already using elements of it in your own way? What bits of the game do you consider not important enough to push past? Supposedly, The Hermetic Garage was not written as a complete piece, but happened as a stream of consciousness/free association excercise. One has to be amazed at Moebius’ genius in tying it all together and as you said, making one want to know what follows! I’m not connecting with this idea at all. Undoubtedly my fault, I’m almost certainly not understanding it correctly, but it seems to me that the players in most games want to make those die-rolls the examples in the articles elide – the rogue doesn’t want to pick the lock, she wants to check it for traps then pick the lock for example, and she’s on the look-out for the superb successes that may grant some future bonus. As for fading the failures, I am very definitely in two minds about that, both of them hostile to the notion. I have an aversion to “everyone wins” contests of any kind (though every decent GM understands that the game is not a Players vs. GM contest of course). Perhaps “unfailable challenge” is a better way of expressing the idea. Either way, I’m out. I’m obviously missing the point, so I’ll come back and re-read when I have more time. A problem possibly helping to occlude the gist of the article for me is undoubtedly that I often find Moebius comics baffling as far as being able to tell what the hell is going on. That’s the last thing I want to evoke at the table (usually; baffled confusion has its place). Actually, I’ve often suspected that Moebius’s stories do not survive contact with the translator. Sorry, John. I guess I’m not your target audience. I look forward to reading the other comments this article will draw, so I can see what I’m not “getting”. I feel very similar. RPGs work by very different dynamics than any form of linear fiction because the audience is also the main characters at the same time. Watching a character while not really understanding what’s going on can be very interesting and fun, but in an RPG character knowledge equals audience knowledge and if you don’t understand what’s happening, you can only blindly stumble on and let random things happen TO you. You’re barely DOING anything. I agree. While rolling two dice may expedite scenes, it also eliminates the opportunity for improvisation between those two rolls. I love the idea of rolling damage with attack, but rolling to find someone and your diplomacy at the same time removes agency from the game – what if, from the description of the NPC, they are more suited to being intimidated by another PC instead of being charmed by you? Can you take the roll back? I think I will definitely incorporate the “roll damage with attack”, but sometimes you WANT to prolong he investigation scene – it’s a good way to provide exposition without narration.